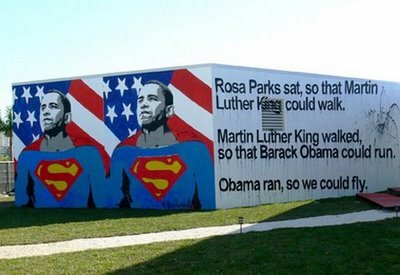 This inspiring Obama mural is highly prominent outside the Art Basel show in Miami right now. It’s another great example of the Obama fervour that is consuming the US and the rest of the world right now. Of course some folk are looking at the administration team he’s put together and saying “More of the same then…” as it’s so Clinton-esqe, and this resonates badly with Obama’s campaign cry of “Change”. For my mind we’ll have to wait and see, and given the amount of obviously disruptive legislation the Republicans are throwing up in their last few weeks, that wait might be a while. We can only hope part of the promised change includes suitable impeachments for people who felt that the US was allowed to operate outside of the moral consensus in its pursuit of so-called terrorists. Somehow I feel we’ll be disappointed on that front. [From coolHunting].